Realtime maps are very popular nowadays. Especially now that there are many on-demand transportation services like Uber and Lyft that have realtime location reporting. In this article, we are going to learn how to build a realtime map on iOS using Pusher. A MacBook (Xcode only runs on Mac). Knowledge of Swift and using Xcode. You can get started here. NPM and Node.js installed locally. Cocoapods package manager installed locally. A Google iOS API key. See here for instructions on how to get a key. As you can see in the demo, every time the location is updated, the change is reflected on both devices. This is what we want to replicate. Let’s get started. 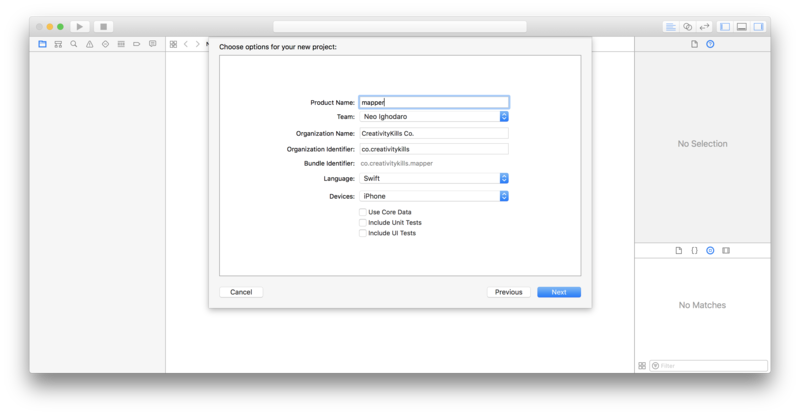 Launch Xcode and create a new "Single-app” project. You can call the project whatever you please. ⚠️ Replace application_name with the name of your application. When the installation is complete, open the *.xcworkspace file that was added to the root of your application directory. This should launch Xcode. Before going back into our iOS application, we need to create a simple Node.js application. This application will send events with data to Pusher. The data sent to Pusher will be simulated GPS coordinates. When our iOS application picks up the event’s data from Pusher, it will update the map’s marker to the new coordinates. The code above is a simple Express application. We have initialized the Express app and the pusher instance. In the /simulate route, we run a loop in 2-second intervals and break the loop after the 20th run. Every time the loop runs, new GPS coordinates are generated and sent over to Pusher. Replace the values of *PUSHER_APP_ID*, *PUSHER_APP_KEY*, PUSHER_APP_SECRET and PUSHER_APP_CLUSTER with the values in your Pusher application dashboard. Our Node.js application is now ready to simulate GPS coordinates when our application triggers it. Now that we are done creating the Node.js application we can return to creating the iOS application. Create an @IBAction from the button to the ViewController. To do this, click on “Show the Assistant Editor” on the top right of the Xcode tool set. This will split the screen into storyboard and code editor. Now ctrl and drag from the button to the code editor to create the @IBAction. We will call the method simulateMovement. 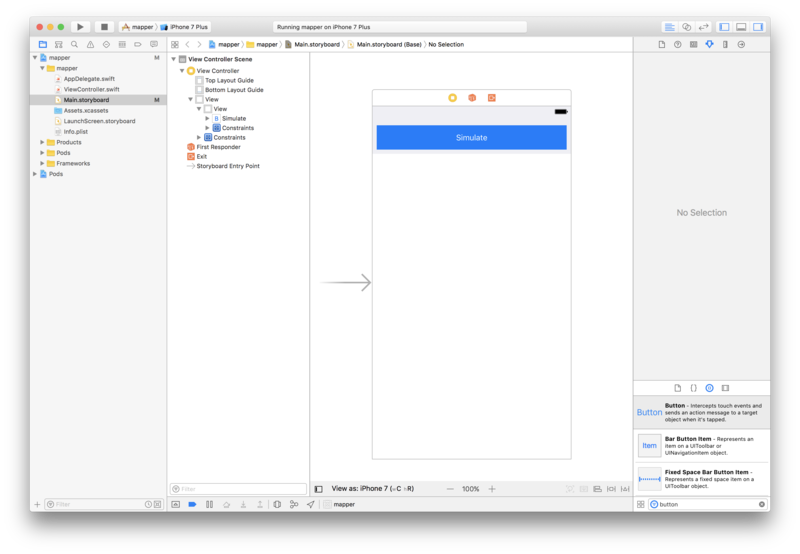 Next, click the “Show standard editor” button on the Xcode toolbar to close the split screen and display just the Main.storyboard. Add another UIView starting from the bottom of the last UIView to the bottom of the screen. This view will be where the map will be displayed. Set the UIView's custom class in the “Identity inspector” to GMSMapView. Now click the “Show the Assistant Editor” on the top right of the Xcode tool set. 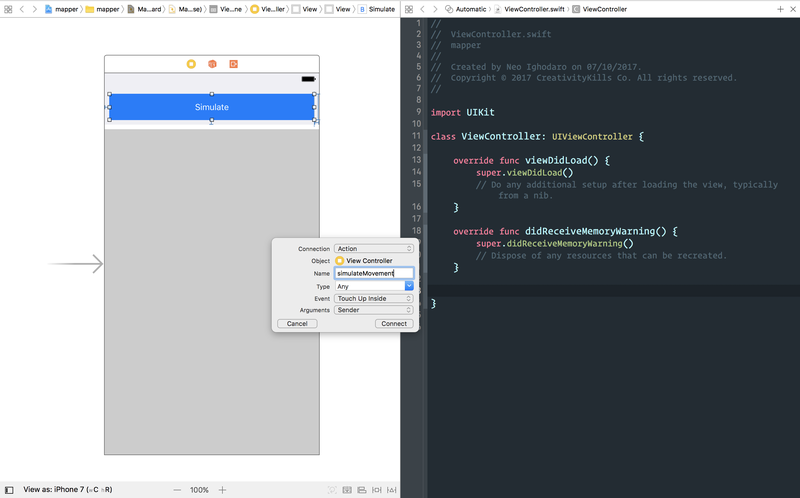 ctrl and drag from the UIView to the code editor. Create an @IBOutlet and name it mapView. @IBOutlet weak var mapView: GMSMapView! // at zoom level 15. // Listener and callback for the "update" event on the "mapCoordinates"
In the controller class above, we import all the required libraries. Then we instantiate a few properties on the class. In the viewDidLoad method we set the coordinates on the mapView, and also add the locationMarker to it. In the same method, we make a call to listenForCoordUpdates(). In the listenForCoordUpdates method we create a connection to Pusher and listen for the update event on the mapCoordinates channel. When the update event is triggered, the callback takes the new coordinates and updates the locationMarker with them. Remember, you need to change the PUSHER_APP_KEY and PUSHER_APP_CLUSTER to the actual values provided for your Pusher application. In the simulateMovement method we just send a request to our local web server (the Node.js application we created earlier). The request will instruct the Node.js application to generate several GPS coordinates. 💡 The URL of the endpoint we are hitting (http://localhost:3000/simulate) is a local web server. This means that you will need to change the endpoint URL when building for real cases. We will need to configure the Google Maps iOS SDK to work with our application. 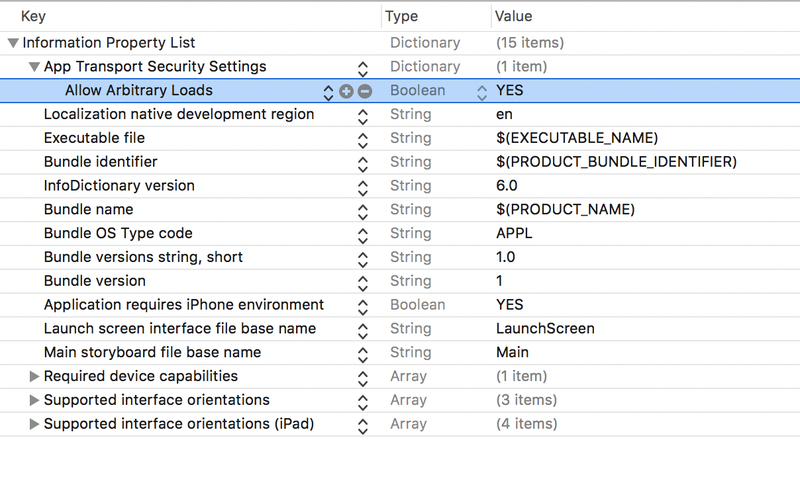 First, create a Google iOS SDK key and then, when you have the API key, open the AppDelegate.swift file in Xcode. 💡 You need to replace the GOOGLE_IOS_API_KEY with the key you got when you created the Google iOS API key. With that, we are done configuring Google Maps to work on iOS. To test our application, we need to start the Node.js application, instruct iOS to allow connections to the local web server, and then run our iOS application. This change will make it possible for our application to connect to localhost. To be clear, this step will not be needed in production environments. Now build your application. You should see that the iOS application now displays the map and the marker on the map. Clicking the simulate button hits the endpoint which in turn sends the new coordinates to Pusher. Our listener catches the event and updates the locationMarker, thereby moving our marker. In this article, we have seen how we can use Pusher and Swift to build a realtime map on iOS. Hope you learned a few things on how to create realtime iOS applications. If you have any questions or suggestions, leave a comment below.